Do you live in a humid climate? Does your indoor air seem too moist or smell musty in summer months? Do you feel physically uncomfortable in your home? Have you recently experienced water damage? Does someone in your home suffer from allergies or asthma? (Excess moisture may encourage the growth of mold and mildew; known allergy and asthma triggers.) Do you find condensation on your water pipes? HealthyAire® Dehumidifiers offer a whole-house solution, providing drier, healthier, more comfortable air! 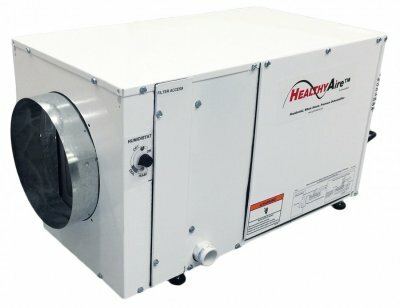 Also useful as part of a comprehensive water damage cleanup plan, HealthyAire® dehumidifier options remove from 70 to 95 pints per day! Capacity: Removes 95 Pints Per Day @ 80° / DBT / 60% RH. Capacity: Removes 70 Pints Per Day @ 80° / DBT / 60% RH.